Montenegrin science journalist Snezana Radusinovic, who attended both workshops in Belgrade in 2013 and Podgorica 2014, realised a long segment on the Podgorica workshop, broadcast at the end of March 2015 on the State TV of Montenegro. Several trainers – Fabio Turone, Connie StLouis, Mićo Tatalović and David Ropeik – were interviewed (the voice over is of course in serbo-croatian-montenegrin). 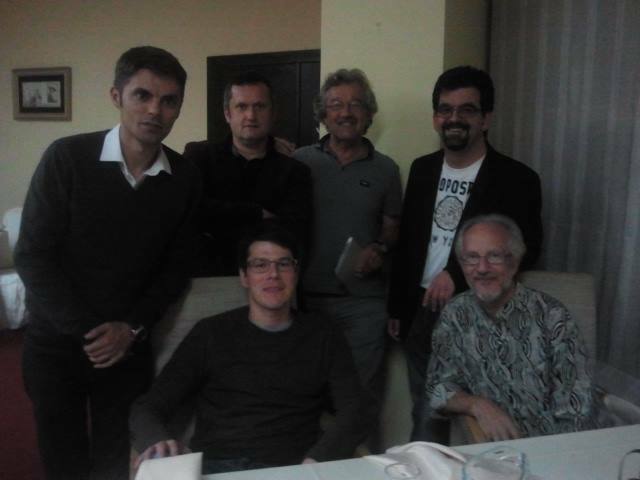 Some of the trainers of the UNESCO Podgorica 2014 workshop on science journalism. From left, standing: Slobodan Bubnjević (Serbia), Peter Mayr (Austria), Joost van Kasteren (The Netherlands), Fabio Turone (Italy); from left, sitting : Mićo Tatalović (Croatia/UK), David Ropeik (United States). This entry was posted in report and tagged 2014, Connie StLouis, David Ropeik, Fabio Turone, Joost van Kasteren, Mico Tatalovic, Peter Mayr, Podgorica, Slobodan Bubnjević, Snezana Radusinovic, TV. Bookmark the permalink.